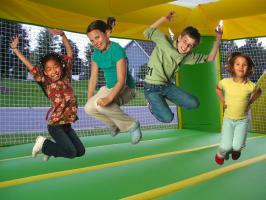 Brevard's #1 Bounce House Company! "The great place to rent Water Slides and Bounce Houses"
We have a huge selection of over 30 items. We carry only commecial equipment. We are always curtious and friendly. No deposit required to make a reservation. Fully licensed, registered, and insured. Low price includes set-up and delivery. Party Jumpers is fully licensed, registered and insured. We deliver to all brevard parks, churches, and schools both public and private. Let use help you plan your next event, birthday party, festival, or celebration. updates manufactured by different company’s may not be depicted on the website. our website, however slight changes in the actual item may occur. How many children can bounce at one time? 10-12 riders for each bounce house. Can bounce houses be setup on concrete or driveways? Waterslides cannot be set-up on concrete.Only Jumpers or bounce houses can be setup on concrete. When you reserve your bouncer please let us know it would be setup on concrete. What kind of deposit is required and how do I pay? We do not require a deposit. We accept payments of cash upon delivery. What if it rains? You can cancel at anytime prior to setup without fee or payment. Kids can still play in light rain. If it rains, leave the blower running. If there is lightning, do not use and turn off the unit. You may turn the unit on again as soon as the lightning has passed. Once the unit is set up, there are no refunds in the event of inclement weather. How do I reserve a Jumper? Call us at 728-8471 We will need your name, address, zip code, telephone number, date and time of party. Payment is due upon delivery. No down payment is needed. How long do I have the jumper for? When you reserve the jumper, the jumper is yours for up to 7 hours. What about wind? No jumper should be operated if wind exceeds 15mph.